What Happens at a Juggling Convention? What Happens at a Juggling Club? 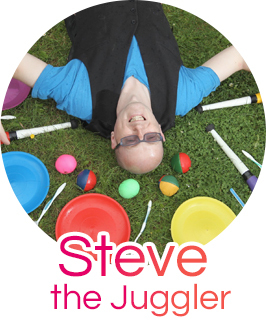 Issue 22 – What Happens at a Juggling Club? Issue 6 – Have you Tried these Circus Skills Props? Shaker cups are also called nesting cups, as they are cups that are designed in such a way so as you can catch (nest) them inside each other. They are designed in such a way as not to stick or wedge themselves together when caught, so the inside cup is ready for release again. This is possibly the noisiest prop in a jugglers performance bag, as they are made from metal and make a huge noise when they clatter together! In order to make sense of which cup is which, I refer to a cup that is being held in the hand as the outer cup, and a cup which is nested inside an outer cone is referred to as an inner cup. Basic Toss (2 Cups) Using just two cups, fit one inside another. Keeping a hold of the outer cup, and flip the inner cup so that it does one complete turn in the air and then catch it inside the outer cup. You can then try to make the inner cup flip several times before you catch it (this trick is known as doubles/triples/etc). Try high and low throws also. Basic Toss (3 Cups) Now have two cups in one hand (one inside the other) and one cup in your other hand. 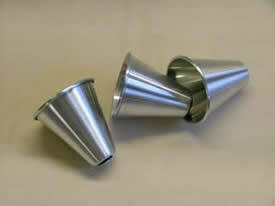 Now flip a cup from one outer cone to the other. Practice throwing back and forth and getting used to the exact amount of spin you need. Hold Back With 3 cups in one hand (one outer cup and two inner cups), use your index finger to hold back the second cup so that you only flick the top cup. Take care not to trap your finger though! Throw all 3 Cups Try throwing all 3 cups and catching them again! Use both hands to catch them, or try to just catch all 3 in your empty hand! This trick is difficult, so keep practicing! Body Throws Take all the moves learned above and combine them with lots of body throws (behind the back, under the leg in all directions etc). Different Catching Position You can also experiment with your catching position such as turning your hand round, and then learn all of these tricks again using your new hand position! FOLLOW / LIKE / SUBSCRIBE / ENJOY!! I am based in Northamptonshire, England, UK. Nearby regions are Bedfordshire, Peterborough, Cambridgeshire, Leicestershire, Hertfordshire & North Buckinghamshire, but work considered throughout the UK! Do you have a question or enquiry? Fill in the form below. Copyright © 2019 Jugglingworld. All Rights Reserved. Designed and Developed by Kanyo LTD.